Krasnoyarsk will be the host for the International University Sports Federation’s 2019 Winter Games. After hosting the Summer World Student Olympic games in Kazan this year, Russia has been selected again by the International University Sports Federation (FISU) to host the 2019 Winter Games. 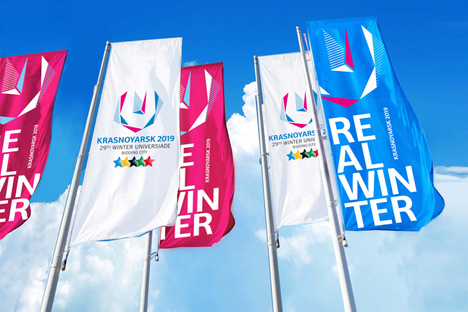 The federation announced on November 9 that Krasnoyarsk would be the venue for the 2019 International University Games, or Universiade, as they are commonly referred. The final presentation was held by the Russian delegation led by Russia’s Sports Minister Vitaly Mutko. The vote was actually a simple confirmation, since the other remaining competing candidate - the Swiss canton of Valais - pulled out in September. The Russian government said it intends to spend about 40 billion rubles ($1.2 billion) to prepare for the 2019 Universiade. Russia has hosted the Summer Universiades twice: in Moscow in 1973 and in Kazan for the Summer Games 2013. FISU commission members voted unanimously to pronounce Krasnoyarsk bid the winner. Fifty percent plus one vote was enough to win, as the Siberian city proved to be the only candidate standing to host the 2019 Winter Universiade. Initially, Krasnoyarsk had two competitors, but after Pyeongchang was awarded the 2018 Olympic Games, the Koreans withdrew their University Games bid. Then the Swiss St. Gallen bid withdrew its candidacy. Instead of a bidding dossier, the Swiss party sent an official letter to FISU, stating that after carefully examining and analyzing the Krasnoyarsk campaign, they decided that the Russian candidate stood a better chance of winning. FISU President Claude-Louis Gallien asserted that the lack of competitors does not imply that Krasnoyarsk was handed the victory by default. “If we see that a candidate will be unable to host the Games on the proper level, we are entitled to start a new bidding campaign, involving other candidate countries,” Gallien said at the time. Since then, International University Sports Federation representatives have visited Krasnoyarsk again and found no problems. Krasnoyarsk filed its bid to the International University Sports Federation office on September 14, together with the bidding dossier, FISU President Claude-Louis Gallien was provided with a government declaration, signed by Russian Prime Minister Dmitry Medvedev. Only five sports facilities will have to be erected or reconstructed in Krasnoyarsk by 2019. In July, Krasnoyarsk regional governor Lev Kuznetsov estimated that investments of approximately 25 billion rubles would be required, but three months later the Russian Sports Minister announced another figure of 40 billion rubles.